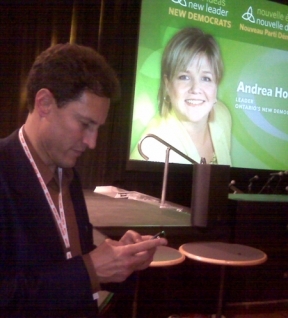 TVO's Steve Paikin used Twitter to report from the floor of the Ontario NDP leadership convention. In all seriousness, the provincial NDP’s interactive strategy for their leadership convention was very well conceived and executed. The coverage featured live video streaming, live blogs, and a Twitter feed that become one of the most active on all of Twitter during the leadership vote on Saturday evening. All this turned out to be essential due to the abysmal news coverage the convention itself received. (Like that Joe Trippi guy talks about: don’t get media, become the media.) From what I can tell, democratic wunderkind Dave Meslin was the driving force behind the whole thing, and both he and the party are to be commended. Another positive indicator along the same vein is that Andrea Horwath, the new leader of the provincial NDP, had a very good (and probably the best) leadership campaign website. We can reasonably expect, therefore, that the NDP will have a strong interactive presence in the next general election. This praise comes with two caveats from me. One is that the importance of a strong interactive strategy for Canadian political parties is, IMHO, currently overstated by many. (I am reminded of my favourite political quote of the year so far. While discussing ways to reach young voters, then-Republican chairman Mike Duncan said “We have to do it in the Facebook with the Twittering.” Priceless. )Â The second is that while I sincerely wish Horwath the best of luck, I’m not convinced she was the best choice (I’m a Peter Tabuns fan), or that she has the right combination of ideas and rhetoric to move her party forward. More on both of those points later. As we approach election day on March 17th, some people I talk to want to be reassured that their vote is going to go towards a successful party with momentum. Well, it is. The [federal] Green party, which has never elected an MP, rose to 13 per cent nationally and was actually a point ahead of the NDP in Ontario â€” 18-17. Bruce Anderson, the president of Harris-Decima, says the Green support may simply reflect voters parking their support in the absence of compelling alternatives.